I heard about Massdrop (full disclosure, if you sign up with that link and 5 or more of you end up buying a drop, I will at some nebulous future point get a box of free things) a few months ago when I saw they had an EDC section, and while in general I don't keep up with the knife/leather goods/etc part of the EDC world (a vegan who is clumsy is a bad fit for that particular set of interests) I immediately noticed some pen drops. As addicts are wont to do, I signed up to keep tabs on what they're offering. The site is a managed group buy venture, to simplify it a bunch. You can join and vote in polls for new drops, but the Massdrop buyers are the ones who manage the price negotiation and then Massdrop takes care of the logistics and shipping. You can save anywhere from 10% to in some cases up to 50% (maybe more to be honest) on things. I've done two, getting a $100 water kettle for 65 bucks, and relevant to this blog, getting a new Stipula Passaporto demonstrator for over 50% off! I signed up maybe a month ago and got my pen last week. It does require some patience, but the savings have been so substantial each time that it's definitely worth it. As for the pen? The pictures don't do justice to just how SMALL this thing is. Capped, it's barely longer than a credit card, 3.5 inches. I immediately disassembled it, and while it came with a cartridge, I got the demonstrator version to use as an eyedropper. Filling it was straightforward using the eyedropper in the box, which is nice and made out of glass. I had just so happened to bring in a bunch of Bernanke Blue I'm gifting to a friend at work, so in it went. I didn't use silicone grease because unscrewing it I could feel some tension that made me not worry about leaking, in the future I may add some. In about 20 seconds I had my first eyedropper fountain pen, and immediately knew I'd be bumping some full size clear pens that can be converted to the top of the list. It's unbelievably satisfying watching the ink slosh around in the barrel. There's a bit of ornamentation, a small leaf on the silver band on the cap that can act as a roll stopper, and a subtle branding on the body, but otherwise is a very simple demonstrator. I'll be honest, I bought this because I liked the idea of a small eyedropper and thought it was a weird little pen, but was skeptical about how much use I'd get out of it. However, if the last 48+ hours are any indication, I'm going to use this A LOT. I don't normally think to write reviews this quickly after acquiring something, but I really have been bowled over. It's not perfect, and it has its quirks, but I really love this pen. I opted for the .9mm stub nib. It's a stainless steel nib, and is pretty stiff, but you get line variation thanks to the stub. If you apply pressure you can get slightly more width on the downstroke, but I don't see myself ever doing that beyond the testing for the review. I've liked the stubs I've tried, but my writing is atrocious, and small, so the normal 1.1 and 1.5 options make my writing a jumbled run together mess. This .9mm is a dream. It's still a little wider than is ideal for my handwriting, I think, but I can't stop writing with it. 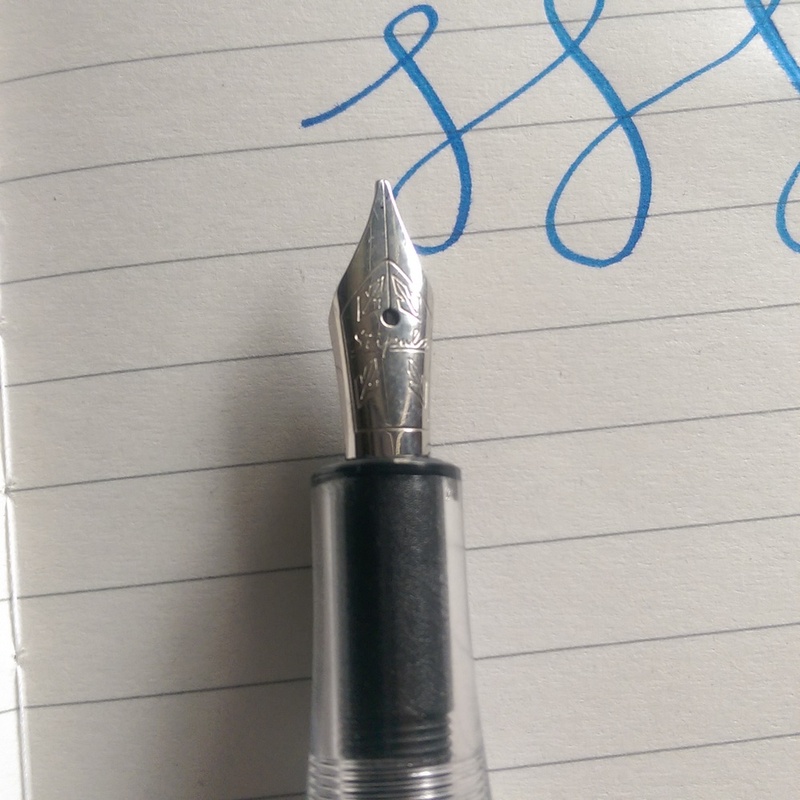 (it's convinced me to send off this and a Kaweco nib to get ground down to a .5mm cursive italic, which I have a hunch will be perfect) It's a wet writer, but not overly so, and has just a touch of feedback so I don't feel like the pen is sliding out of control. No skips the entire time, beautiful line width variation and starts up everytime I pull it out. The one minor thing is that it can sometimes have trouble keeping up with me, but it's infrequent and honestly is more on me than on it, since I sometimes write way too fast. And even when it's struggling to keep up, it puts down a solid line, just not quite as wide as when I'm slowing down. Writing with it unposted is possible, but not very comfortable. It's TINY and way too light for me. It does sit in my hand without too much trouble unposted, but beyond testing it for the review, I'll never write with it like that. Which brings me to my one true complaint. The cap posts, but not easily. When you get it posted securely, it stays and I have no worries about it wiggling off or moving, but getting it wedged on is, well, literally just a matter of wiggling it around to wedge it on. There's a newer version of this pen that has threads on the back for ideal posting ease I believe, but the one I received doesn't. It takes some force, and some wiggling to get it fully locked in place. I can always get it posted, but it's really not ideal. Even with that complaint, I love this pen. In the last few days I've reached for it more than almost anything else (save the Edison Hudson). It's so tiny, but when posted is surprisingly substantial and satisfying to hold. I've written the entire first draft of this review and multiple pages of journaling the last few days without any noticeable fatigue. I got mine at a deep discount, but I wouldn't hesitate to get another at full price if something happens to this down the road. It's not a pen for everybody, and not perfect, but so far it's been pretty perfect for me.